Vicki Presco refused to give me the names of the people that invited Christine to Rocky Point. “It doesn’t matter. They moved on!” Vicki spat, irritated that I dare ask questions. I talked to Donald Layne’s wife, and she verified Alan Fox owned RP. I began to suspect Judge Richard M. Silver was protecting Alan Fox. I did not think to file a Wrongful Death Suit. Did Richard consider this? I got the distinct impression these Wealthy Folks of Carmel looked down on me and saw a parasite. They have attorneys by their side 24/7. This is how one conducts business. There is no REAL death scene for Christine Rosamond Benton. This is why no WDS was filed, because, the insiders knew my beloved sister – killed herself! This leaves the life insurance policy that Stacey Pierrot told me about, that put a small sum into the hands of Drew Benton, who was eight at the time of her mother’s death – and her near-death experience………..THAT DID NOT HAPPEN! All the liars were agreeable. Then, I showed up. This is why that very rich and powerful man gave me a dirty look as I stood next to my mother. I have long suspected folks close to me are secretly given money to Gaslight me. Did Belle Burch do some investigating before she – and her comrades – contacted me? SLEEPS was good at ferreting out money. They searched my blog. Alan claims he is a billionaire. He just got married. Steve Harvey says Alan contributed generously to his foundation. He founded Rattle. He never dreamed a mother would take her eight year old daughter down to the water. I want his personal opinion. Alan C. Fox (born June 30, 1944) is a New York Times bestselling author, and founder of the Rattle Poetry Journal. He is also president and founder of ACF Property Management, a commercial real estate company based in Studio City, California, and an active philanthropist. Fox has an MFA in professional writing from the University of Southern California and has written two books: People Tools: 54 Strategies for Building Relationships, Creating Joy, and Embracing Prosperity, which made both The New York Times Best Seller list and the Publishers Weekly Bestseller list in February, 2014. and the sequel, People Tools for Business: 50 Strategies for Building Success, Creating Wealth, and Finding Happiness, published in September 2014, made the Los Angeles Times Bestseller List. Fox is also editor-in-chief of the Rattle Poetry Journal, a nationally recognized publication based in Los Angeles. Rattle has featured the work of Philip Levine, Jane Hirshfield, Billy Collins, Sharon Olds, Gregory Orr, Patricia Smith, Anis Mojgani, as well as many new and emerging poets, and hosts an annual poetry competition. In 1999, Fox co-founded the Freida C. Fox Family Foundation, which provides grants, consulting, and project based technical assistance for youth and education focused initiatives. In 2011, Fox and the Foundation established the Youth Philanthropy Connect National Convention, which is held annually to encourage children and teenagers to become active in helping others. In 2015, Fox donated $20 million to the University of Arizona School of Music in honor of his father Fred Fox, a well-known French horn player. Fox also made a surprise $200,000 donation to the Steve and Marjorie Harvey Foundation, announced on-air during a January 16, 2015 appearance on The Steve Harvey Show. Fox serves on the board of directors of a number of nonprofit organizations, including The Center for the Healing Arts, Bright Prospect, and The International Trauma Institute, and has also been a political fundraiser. Alan Fox has lived a long and joyful life, achieving tremendous success in many different arenas, both personally and professionally. He has advanced degrees in accounting, law, education, and professional writing. He has expanded his commercial real estate company, ACF Property Management, Inc. into a billion dollar enterprise since founding it in 1968. He founded Rattle Poetry Journal (in 1994), a nationally renowned publication including his conversations with noted poets. He’s an active philanthropist, founding The Frieda C. Fox Family Foundation, a non-profit that provides funding to youth education projects. And in the midst of all this, he has raised a large and loving family with his wife of nearly 35 years. HOW DID HE DO ALL THIS? Alan attributes his happiness and success to consistently applying his People Tools, the simple, practical life lessons that he’s accumulated—and practiced—over the years. Now after 75 years of joyful living, Alan is dedicated to sharing his wisdom with as many people as possible through his writings, public talks, and media appearances. His first book, People Tools: 54 Strategies for Building Relationships, Creating Joy, and Embracing Prosperity (January 2014) made two New York Times Bestseller lists and impacted the lives of thousands of readers worldwide. The second in the series, People Tools for Business: 50 Strategies for Building Success, Creating Wealth, and Finding Happiness (September 2014) made the Los Angeles Times Bestseller list, and has been featured on a variety of media outlets including The Huffington Post, Steve Harvey Show and The Meredith Vieira Show. In his new book People Tools for Love and Relationships: The Journey from Me to Us, which will be released this August, Alan lays out time-proven techniques that you can use to enhance your connection with your spouse or partner, your family and friends—in fact with anyone who is important to you. From learning how to talk about money with your partner, how and when to apologize, to increasing trust and intimacy, each tool addresses a specific issue and provides a simple, straightforward approach that you can adopt to create a positive result. ALAN’S MESSAGE IN EACH OF HIS BOOKS IS SIMPLE: the key to happiness and success in life is building strong relationships. That’s exactly what Alan has done throughout his life. 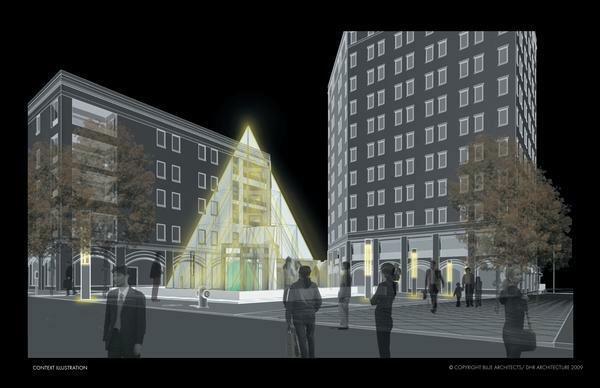 The pyramid, which would have a restaurant or retail below ground in what is now a parking garage, is designed to help open up the development, built in the late 1970s. The new owner of Writer Square plans to rejuvenate the downtown development with an ambitious plan that calls for a glass pyramid with restaurant or retail space below street level. Developer Gary Dragul’s vision is reminiscent of the Apple Store in New York City. The planned structure at the corner of Lawrence Street and the 16th Street Mall would also have a moat. Writer Square, built in the late 1970s, already includes a mix of retail, office and residential buildings. Dragul’s plan aims to make the area’s public spaces, which provide a link between the 16th Street Mall and Larimer Square, more appealing. Dragul said the project is contingent on securing a tenant for the new 12,000-square-foot structure, which now is part of the development’s underground parking garage. Meanwhile, he’s moving forward with plans for the rest of Writer Square, which he and partner Alan C. Fox of ACF Property Management Inc. in Studio City, Calif., bought for $58.4 million in September. New retailers, events and performance space will be included in a European-style plaza free of the planters, furniture and sculptures that currently make the space feel like an obstacle course, said Don Ruggles, founder and president of the architecture firm D.H. Ruggles & Associates. “The plaza will have new signage, lighting and remodeled storefronts,” Ruggles said. Tenant Jeff Morris said he’ll miss the planters outside his store, Chez Cheese. Jim Kirchheimer, director of economic development for Downtown Denver Partnership Inc., said he supports the plans. Writer Square was developed by George “Geoie” Writer of Writer Corp., which built homes in the metro area for many years and was later acquired by Standard Pacific Corp. Construction of the square began in 1979. Retail expert Mary Beth Jenkins, president of The Laramie Co., said any project more than 10 years old is due for a face-lift. To be successful, the pyramid will require a destination tenant to attract people to the area, Jenkins said. “You need a very strong tenant that can break the rules of being on grade in retail,” she said. Dragul’s plans for Writer Square coincide with several other downtown rejuvenation projects: the $70 million renovation of the Sheraton Denver Downtown Hotel at 1550 Court Place; the $25 million investment in the Denver Pavilions; the renovation of the old Fontius Building; and the overhaul of McDonald’s — all on the 16th Street Mall.